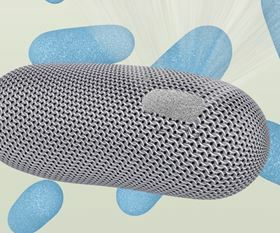 Emulating the biological chainmail armor that coats so many microbes could lead to new self-assembling materials with complex two- and three-dimensional structures, according to a study at the Lawrence Berkeley National Laboratory in California. Caroline Ajo-Franklin and colleagues have used high-throughput light-scattering measurements to study the self-assembly of 2D nanosheets from the common bacterial surface layer (S-layer) protein, SbpA. This protein forms a protective layer around the soil bacterium Lysinibacillus sphaericus although how it forms exactly has remained a mystery until now. The team's scattering studies provide an important clue showing how calcium ions are critical in two ways to its assembly. Ajo-Franklin and her colleagues suggest that their light-scattering technique could be used for studying any type of protein that is able to self-assemble into a 2D nanosheet and so could be used to monitor growth from the nanometer to the micrometer scales. The crystalline nanosheets that S-layer proteins form have lattice symmetries and pore sizes of similar dimensions to quantum dots and nanotubes, which makes them a compelling model for biomimetic nanostructured arrays of organic and inorganic materials that can be fabricated from the bottom up. In addition, given the robust nature of the S-layer proteins and their adhesive qualities - bacteria also use their S-layer armor to attach themselves to their surroundings - there could be many intriguing applications of the fabricated nanosheets. "One project we're exploring is using S-layer proteins to make adhesive nanostructures that could be used to remove metals and other contaminants from water," Ajo-Franklin explains. "Now that we have such a good handle on how SbpA proteins self-assemble, we'd like to start mixing and matching them with other molecules to create new and useful structures." David Bradley blogs at Sciencebase Science Blog and tweets @sciencebase, he is author of the bestselling science book "Deceived Wisdom". Scientists have studied the pangolin to learn the secrets of its protective outer armor. Morgan Advanced Materials says that 16 ACV prototypes will be fitted with the company’s composite armor systems. Permali Gloucester will supply composite ballistic armor panels for the Supacat range of armored vehicles.